Genetic mutations can affect all living organisms, both human, plant or animal. Africa is a continent with many beautiful and unique animals. It is no wonder that scientists for decades have gone in search of exceptional creatures that penetrate the endless savannah length and breadth, looking under every bush and stone. The effect? The discovery of dozens of new species of animals. One of the most characteristic African animals is the giraffe. It is a cloven-hoofed mammal and the tallest animal on our planet, whose neck is 5-6 meters long! These powerful animals are herbivorous and weigh from 800 kilograms to 1600 kilograms. Meeting a giraffe on the savannah in Kenya is not uncommon, but it is something absolutely unique to encounter white giraffes and their young together nibbling on acacia leaves! These unusual giraffes likely suffer from albinism, which is the lack of the enzyme tyrosinase, which is responsible for pigmentation of the skin or suffering from a genetic mutation called leukemia, where not all the melanin in colored skin and fur is produced. 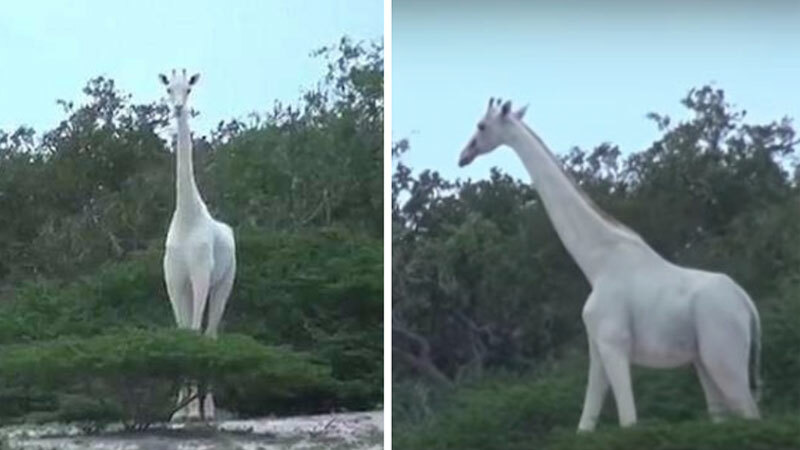 Unusual white giraffes were filmed in the protected area of ​​Ishaqbini Hirola Conservacy, located in Harris County. Until now, such giraffes have not been captured on video, although they were seen in Tanzania and Kenya in early 2016.